Here's all you ever needed to know about this weekend's district track meet at Midview High School in Grafton. This is the first year in a long time that the district will not be hosted at Orrville. Because of the condition of our own track and the ongoing construction of the new high school, it was decided to move the district to a new location. Here's the tournament information page courtesy of Baumspage.com and here's the schedule of events and here's the entrants in each event and their seed times. I think the Orrville boys and girls have good shots to finish high in the team standings, and in doing so, send a lot of athletes on to regionals and hopefully the state meet. The boys regional will be held at Lexington while the girls will travel to Bedford. This is the first time in a long time that the boys and girls teams will be split up at the regional round. Good luck to the Orrville athletes and here's to continuing a great tradition that is the Orrville Track & Field Program. If you're looking for updates from the track weekend, make sure you like me on Facebook and follow me on Twitter. Pretty sure you don't need to sign up for either service just to view my posts/tweets, so don't be scared of it. I'll be posting updates there as I get them. This is a belated congratulations but wanted to recognize the boys and girls track teams for their performance at last week's OCC meet in Lexington. 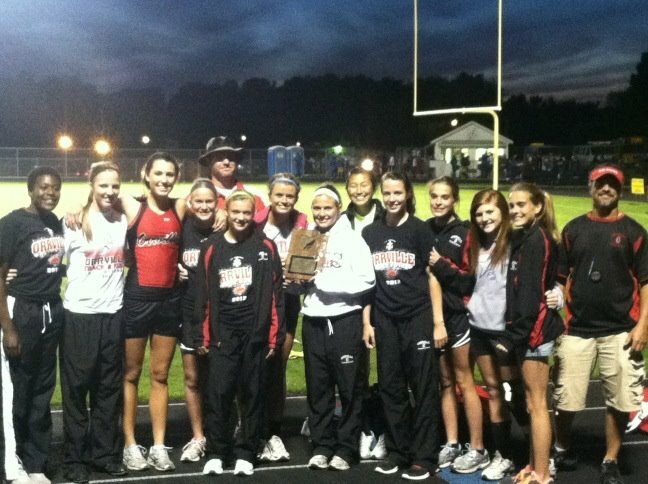 The OHS girls team (pictured above) won the meet and the boys finished 2nd to Lexington. It was the 2nd time the girls had won the OCC in track, with 2008 being the first. Congrats Coach Ayers & Coach Mosley and their staff for all their hard work. Amazing to me, that 8 of our 9 OCC team titles have been won by girls teams. Our "go-to" boys sports over the years of football, basketball and track have amassed a total of 1 OCC title. Orrville Baseball Wins District Title!! Orrville Softball Clinches OCC Title!